Dart’s Christmas tree farm in Southold. If you have never cut a live tree for Christmas before, consider doing it this Christmas. It will create special memories for years to come, especially if you make a weekend of it! The North Fork of Long Island is THE place for cutting your live Christmas tree, and there are several great Christmas tree farms where you can do it. You don’t have to be a lumber jack, the friendly folk at the Christmas tree farms will give you as much help as you require. Just bring a pair of work gloves and cord. Most places even supply the cord, but you never know if they may run out so best to be prepared! Dart’s Christmas Tree Farm,2355 Main Bayview Road, Southold, NY 11971, 631-765-4148. They also offer pre-cut, wreaths, ornaments, decorations, and hayrides. 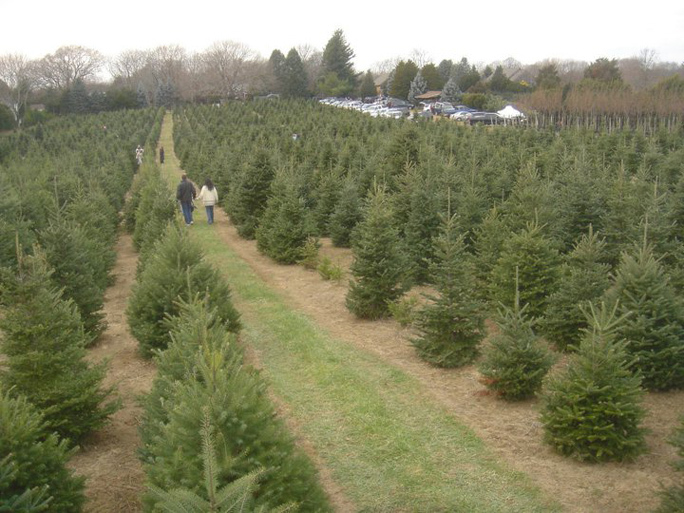 9 a.m. to 5 p.m.
Lewin’s Christmas Tree Farm, 812 Sound Ave. , Wading River, NY 11792, 631-929-4327. They also offer pre-cut, wreaths, ornaments, decorations. 9 a.m. to 4 p.m.
Santa’s Christmas Tree Farm, 30105 Main Road, Cutchogue, NY 11935, 631-734-8569. They also offer pre-cut, wreaths, ornaments, decorations, hayrides. 9 a.m. to 5 p.m.
Shamrock Christmas Tree Farm, 20685 Main Road, Mattituck, NY 11952, 631-298-4619.They also offer pre-cut, wreaths, ornaments, decorations, train rides. 9 a.m. to 5 p.m.
Verderber’s Landscape Nursery & Garden Center, 459 Main Road, Aquebogue, NY 11931, 631-722-4388,They also offer pre-cut, wreaths, center pieces and ornaments. Tuesday to Saturday 8 a.m. to 5 p.m. , Sunday 8 a.m. to 4 p.m.
← This Year, Have A North Fork Christmas!